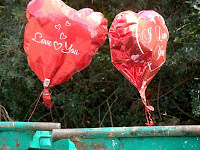 I just thought the idea of a helium balloon - originally designed to bring a smile to someone - floating out of a garbage bin was a curious sight. Granted the title and the picture might seem to point towards a very grim comment. That is not my point here. When I took this picture, I just thought the idea of a helium balloon - originally designed to bring a smile to someone - floating out of a garbage bin was a curious sight. In this case, I guess the curiosity is doubled, and the effect amplified by the wind (not captured in the picture) toying with both balloons, bringing them closer together to the point where they almost kiss, then pulling them apart again. The tragedy of it all is that the two balloons were placed in separate garbage bins. Seems like a Happy Never After kind of story to me.